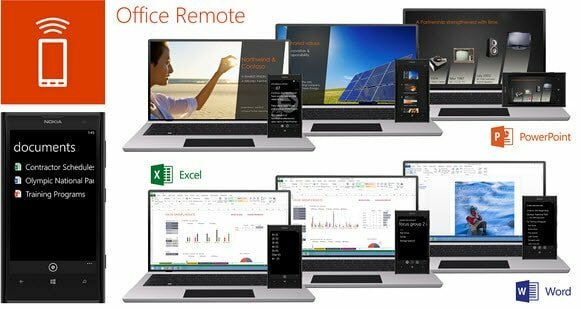 The Microsoft Research team in collaboration with the Office product team have released a new App for Windows 8 Phone users called Office Remote. The Microsoft Research team in collaboration with the Office product team have released a new App for Windows 8 Phone users called Office Remote. The remote app allows you to control various aspects of Microsoft Office 2013 Documents (and Office 365 docs) via Bluetooth, taking the concept of the wireless mouse to the next level. PowerPoint Navigate next slide/previous slide – View slide thumbnails and jump to slide – View speaker notes on phone – View presentation timer and slide progress – Laser point using touch on your phone. Excel – Navigate rows and columns – Change sheets by swiping – Use Slicers, PivotTables and Filters – Jump to any named object in your workbook – Change zoom level. Word – Jump to headings – Jump to comments – Screen up/down – Line up/down – Change zoom level Would be great to hear from someone has has Windows Phone 8 and can give this a try. If you happen to have a Windows Phone and get this up and running, drop your thoughts on the site via comments below and tell me about it. Is it smooth? Intuitive? Value-Add vs. Wireless Mouse? Let me know. Personally, I’m waiting for the time I can just run the presentation from my phone. Running presentations from PC’s is just so…. 1990. Everyone has a mobile device with an OS so tell me again why manufacturers are still making us use a PC to easily present our deck? Drives me crazy! Would be nice if MS released it but I wouldn’t hold your breath. This came from the MS Research Lab so I wouldn’t count on it being DEV’d for iOS or Droid anytime soon.